Assassin's Creed III: Liberation , the new portable entry in Ubisoft's popular historical adventure series, offers up a few genuine surprises. 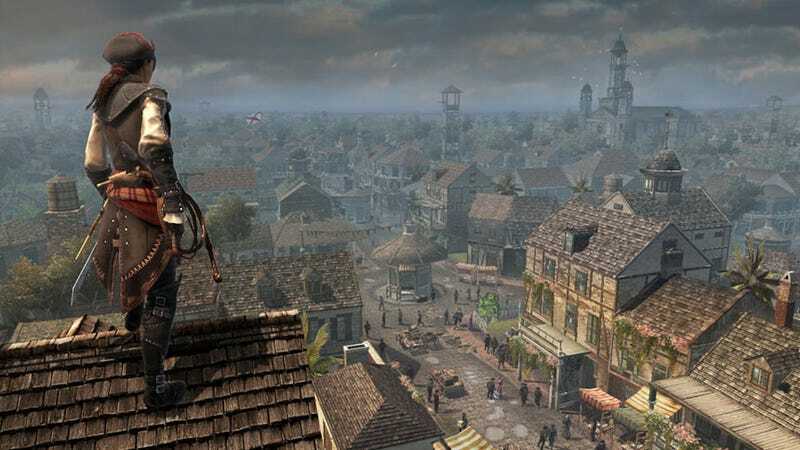 It's impressive how well Ubisoft managed to cram a fully-packed Assassin's world onto the handheld PSVita, and players might be surprised at the myriad ways that historical tropes from the African-American experience show up in the game. Another surprise waiting in Liberation is how good its sweeping, haunting soundtrack is. The woman behind the game's sonic backdrop is American composer Winifred Phillips. She composed the score for Liberation, and her work has just been nominated for "Best Soundtrack Album" and "Best Score - Mobile" in the Hollywood Music in Media Awards. Phillips took some time to answer some questions about Liberation's soundtrack and how she approaches making music for games. Kotaku: Aveline is the product of two people from radically different cultures coming together. How did you try to represent that theme musically? Phillips: Aveline is a fascinating character, and she proved to be very inspiring musically. Her heritage includes the influence of African culture from her mother and European culture from her father. This provided me with a wealth of ideas. Her European side could be expressed through the classical sophistication of the Baroque period of musical composition, including the harpsichord, string orchestra and virtuoso soloists that typify that genre. Her African heritage could find expression through driving and complex rhythmic percussion, bamboo and wooden flutes and other instruments such as shakers, kalimbas, etc. This provided me with a broad instrumental palette and a lot of musical styles from which to create a score that highlights the stark contrast between the two cultures influencing Aveline's personality. The persona-switching plays a big part in Aveline's role as an Assassin. Does a mechanic like this mean more work for you, as someone who's responsible for communicating the game's ideas musically? The persona-switching mechanic is a fascinating way to express how Aveline is balanced between fundamentally different cultures. As a daughter of a sophisticated European gentleman, Aveline can dress like a high-born lady and mingle in that rarified society. However, as a woman of color, Aveline can dress in the modest clothes of a slave and assimilate perfectly into that world as well. Apart from these, when she dresses as an Assassin, she steps away from both those roles and embodies the dark and secretive history of the Brotherhood. All three of these societal spheres have very distinct atmospheres that all suggest particular choices in musical instrumentation and style. The trick was to show that Aveline's inner world is an amalgam of all three of these social spheres. I wanted to combine them so that there was a sense of conversation and interchange between them. Was there anything that you tried to do sonically to establish that Aveline is a different sort of game protagonist? Aveline's history is darkened by the loss of her mother at an early age, so there was always a sense of melancholy associated with this. At the same time, Aveline is a fierce advocate for social justice and liberty, striking out against both the travesty of slavery and the oppression of the occupying Spanish forces. I wanted to communicate this balance between ferocity and vulnerability in the score. In addition to the other instrumental choices to represent her cultural background, I used female voice as a symbol of Aveline's personality. It communicated her vulnerability and gentleness, and was interesting juxtaposed against the more aggressive musical elements in the score. You have to invoke a lot of different parts of the world — Africa, Old World Europe over the course of the game. What moment do you feel achieves that best? The main theme was my opportunity to crystalize all these elements into one unified expression of Aveline's character. It uses both the European and African musical approaches, as well as several melodies that occur repeatedly throughout the game. The Stealth theme has this mournful undertone created by the cello tones. What were you trying to evoke there? I think that the Assassin's Creed franchise has done a great job of portraying the inherent gravity involved in assassinating someone. There is something very solemn about it, particularly as the targets utter their last words. While completing an assassination represents a victory, it is also the end of a life, and Assassin's Creed has never trivialized that. The Stealth theme represents the inner mental preparation for an Assassination, the covert actions taken to set up the ideal circumstances for an Assassination to take place. I wanted it to feel appropriately solemn, so I used a cello solo. I liked the rich darkness of the tone. I also think that Aveline's sense of loss infused this cello with a little sadness, which gave a deeper level of emotion to the track. The Docks track is one of my favorite from the game's soundtrack because it sounds stately with a tinge of danger bobbing about. Obviously it's meant to go with a particular locale, but was there a specific sequence of the game that inspired this piece of music? The Docks were a paradox of sorts for me, representing both a location typified by bustling business and activity, and a potentially dangerous place riddled with outlaws. Balancing the energy of the place with the potential for danger was tricky. With a game like Assassin's Creed III Liberation, you'd never know what might happen on The Docks at any given time, so the track needed to portray many things at once. I used a leading melody that conveyed mischief and energy, and set this against elements of brass and percussion that darkened the overall effect and gave it more menace. How did the game's setting and mechanics influence the decisions about instrumentation? The historical period dictated some of my instrumental choices, since I didn't want to use any instruments that were not in keeping with the period. The music of New Orleans of that time was much different than what we are familiar with today. Many folk influences wove throughout it, and I tried to use the folk instruments that would evoke the time period correctly. I also relied on harpsichord, woodwinds and string orchestra to enhance the atmosphere of wealthy New Orleans society. Kotaku:How much of the game did you absorb before going off to generate ideas? Do you start work after the game is built and playable? Or is your involvement something that precedes that? With every game, the process is different. In this case, much of the game was built when I began composing music, so I was able to experience the gameplay and get a sense for the overall flow of events in the game. I also relied on the concept art and design documents that the team had created, in order to make sure that I was fully understanding their vision for the game. Can you talk a little about your musical training and professional background? I was trained in classical voice and keyboard, and I always knew that I wanted to compose music for a living. My first job was as the composer for the Radio Tales series for National Public Radio. The series dramatized classic works of literature for the radio, including such stories as Beowulf, Homer's Odyssey, H.G. Wells' War of the Worlds and Edgar Allan Poe's Pit and the Pendulum. That series was created, hosted and script-edited by producer Winnie Waldron, so that was my first chance to work with her. When the opportunity came to join the music team for God of War, I asked her to come with me and team up as my music producer for my game projects. What other game composers do you admire? Have here been any big surprises for you working in video games as opposed to other media? I admire a lot of game composers, and I don't think I could single out just one. I also admire a lot of film, television and symphonic composers. I think that working as a game composer is a very unique experience, and quite unlike any other job that a composer might have. Game music is interactive by nature, so it has to be written to very rigorous technical specifications and constructed so that it can fit into the flow of gameplay and enhance the action at any given time. Also, game music sometimes occupies a more prominent position than film and television music, because it often plays without any dialogue obscuring it. A gamer can hear the music of a game more clearly, and therefore it becomes especially important for the game composer to faithfully realize the artistic vision of the game development team. I enjoy my work in the field of game development very much. Is there an example of something — in terms of arrangement, tempo or instrumentation — you would have done in, say, the LittleBigPlanet games you've worked on that wouldn't have worked in Liberation? LittleBigPlanet is driven by humor and whimsy, so my focus in creating music for it was in combining unlikely instruments for the purposes of humor. Calliope, beatbox vocals, rock guitar and an operatic vocalist were the major influences in one track for LittleBigPlanet 2. I thoroughly enjoyed the challenge of invoking humor by making surprising musical choices. For Asssassin's Creed III Liberation, I needed to take a more cautious and judicious approach to instrumental choices, in the effort to create a unified musical atmosphere that would draw the gamer further into the experience of playing the game and exploring Aveline's world.